Lewisville, Texas (December 13, 2017) - Fairview Microwave Inc., a supplier of on-demand microwave and RF components, has launched a new series of waveguide to coax adapters that cover a frequency range of 1.7 GHz to 110 GHz in 22 waveguide bands. Typical applications include test benches, instrumentation, high efficiency RF/Microwave transmission, MILCOM, SATCOM, radar and telecom. Fairview's new line of waveguide to coax adapters consists of 77 models in sizes of WR-10 to WR-430. These adapters are offered in a wide selection of waveguide flanges, sizes and materials. They support 10 types of coax connectors and are available with UG (square/round cover), CMR, CPR, UDR and PDR-style flanges. These waveguide to coax adapters deliver VSWR performance as low as 1.25:1 and are available with aluminum, gold-plated aluminum, gold-plated copper or painted copper alloy finishes. 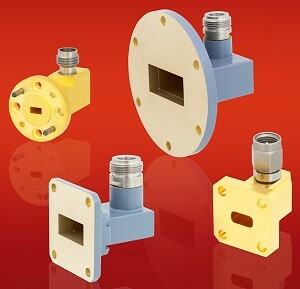 "We are excited to unveil this full range of waveguide to coax adapters with 10 coax connector options, multiple types of flanges and covering 22 bands from 1.7 GHz to 110 GHz. These waveguide to coax adapters are a perfect addition to our growing waveguide product portfolio designed to meet our customers' rigorous requirements and urgent needs," said Steven Pong, Product Manager. Fairview's waveguide to coax adapters are in stock and ready for immediate shipment with no minimum order quantity. A leading supplier of on-demand RF and microwave products since 1992, Fairview Microwave offers immediate delivery of RF components including attenuators, adapters, coaxial cable assemblies, connectors, terminations and much more. All products are shipped same-day from the company's ISO 9001:2008 certified production facilities in Allen, Texas. Fairview Microwave is an Infinite Electronics company.